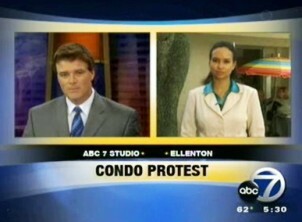 ELLENTON - An unusual protest today. An Ellenton woman says her condo association told her she can't keep her gate. So to protest, she's chained herself to it. Linda Lattin has been out all day in the rain, chained to a metal gate, a gate that is causing a lot of controversy in her community. She has a disability, loves her two dogs, and says the gate makes life better for everyone in her household. Lattin lives in her Palm Cove Villa home with partner Jim and her two dogs. She's been there for 7 years. But being in a wheelchair makes it hard to get around especially with two active dogs running from place to place. "We have a problem with the dogs coming to the door. 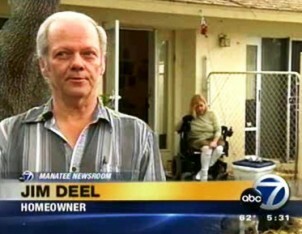 Linda, two times she's rammed her head into the door stopping for the dogs," says homeowner Jim Deel. About three weeks ago, the family put up their gate to keep the dogs confined and Lattin safe. But now the condo association says it's against the rules. "I'm on the board. I got a certified letter because three of the other board members decided we should take it down. I'm on the darn board, I was never asked," says Lattin. She was informed of the violation after getting a letter from the association's lawyer, and to protest she's chaining herself to the gate. "I have until next Friday to take it down or they're going to do it and charge me for it. I think hey, you're not taking this fence without me, pure and simple." Deel, who is outraged at the association's decision, says they should make an exception to the rule. "If I were a board member, I'd say in the future you can't do this without our permission but I can see there's a need for it. So we're allowing you to do it." And now Lattin says all she wants is to keep her gate because it makes life easier. "I'm not trying to make a spectacle. I'm just trying to make a statement: ‘hey, you can't do this to me'." was never approved by the condo association. The statement says the gate doesn't benefit Lattin directly but only her two dogs. The family has until next Friday to comply and remove the gate or the association will remove it for them.